the value of an object that is too long to be displayed in the audit log viewer. So for example when the user changes the META description of a post, if the value of the old and new META description is too long the Alert in the audit log viewer only reports the change, as can be seen from the below screenshot. To see the details, such as the value of the META description that the user has changed, open the data inspector. 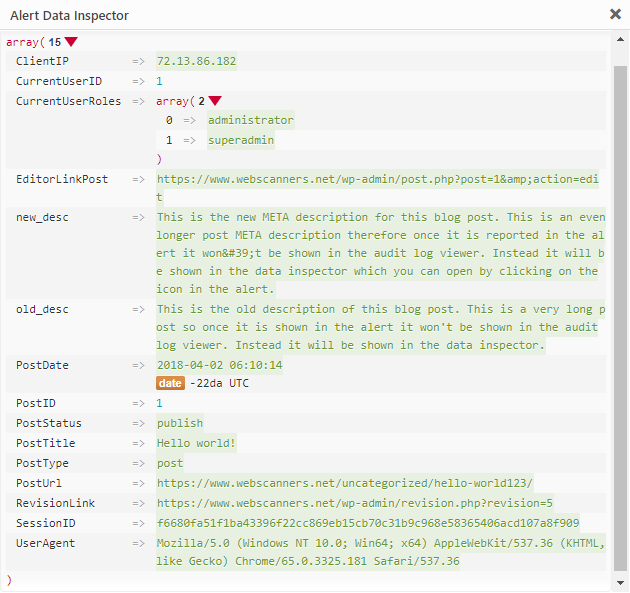 Below is a screenshot of the Data Inspector showing the changes of the META description of a blog post. Notice that in it you can see both the old and new description, and all the details the plugin records about the post such as the Post ID, status, type, URL and revision link. The plugin also stores the Session ID of the user who did the change.